Come experience the high adventure of the Blue Ridge Mountains and the breathtaking scenery of the Shenandoah Valley of Virginia that can only be found in a hot air balloon. Whether above looking down onto the valley or brushing along the treetops of a ridge, the time spent is one you will never forget. From the cool crisp mornings of winter to the warm afternoons of summer; spending time with a group of friends or asking that someone special to spend their life with you; the balloon ride you take will be like no other. If you're from the valley, you'll see those familiar farms, ponds and apple orchards. If you're not from the area our pilot will point out the early morning fog rising off in the distance on the Shenandoah River or the sun setting over the mountains and only then will you know why the mountains are called the Blue Ridge. At the end of every flight the traditional "Post-flight Toast" occurs with your choice of Champagne or Sparkling Apple Cider. From there, if you need help finding a place to eat, a Bed and Breakfast where you can spend the evening, or other area attractions please reference our Area Information guide. 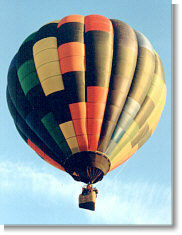 If you want to turn a special event into an extraordinary experience Blue Ridge Hot Air Balloons can do it. From a tethered ride, to flying a banner across town or at a special event. Makes a Memory that Lasts a Lifetime!! Flights cancelled 72 hours prior to scheduled time will be charged a $50.00 per person cancellation fee.